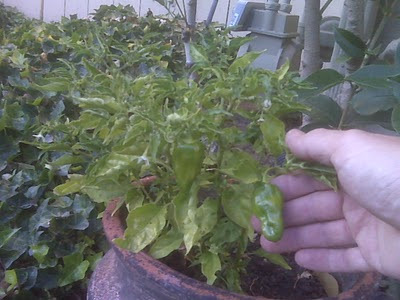 Although hard to see it here in this image, Fremont CA real estate grows good Habanero peppers. Habenaros are quite touchy and slow to germinate from the seed and even slower to grow--especially when you are watching them daily. Why the mention of Fremont CA real estate? Because I was told that the native soil found in and around Fremont CA (real estate) is composed of a good amount of adobe clay and not the best for peppers, much less the slow and temperamental Habenaro. It was hard for me to make the adjustment from where I grew up in Sunnyvale where the black soil there grew almost anything without even trying. Here using Fremont real estate, I will tell you what I did to get them this far. I bought a few nice golden Habenaros from the store and, after using them for a few fiery recipes, I carefully (with gloves) washed the seeds for drying. After a day or two, the seeds were clean and dry. Believe it or not, certain molds love to grow on hot peppers. I then did a bit of research. Strangely, a blog post with the headlines of something like, "Use Your Dryer to Germinate Habenaros." here at http://www.urbanchiles.com/growing/022805.html. The post/page caught my eye. Intrigued, I delved into the article. The short of it was that the normal household uses the dryer a few times a week. the top of the dryer reaches a snugly 90 degrees or more for moderate durations. The writer discovered that setting the seeds in a container with moist soil, provided 100% germination. Mine was 50%, and I blame my cat for hogging the heat. As you can see, I have mine in a pot now. I did the dryer method and then transplanted them outside in a pot with a mix of Fremont soil and a bit of stuff from the worm bin out back.